This is actually new old work from back in May, but I only recently got a chance to get photos of it when I was in Calgary for an event. 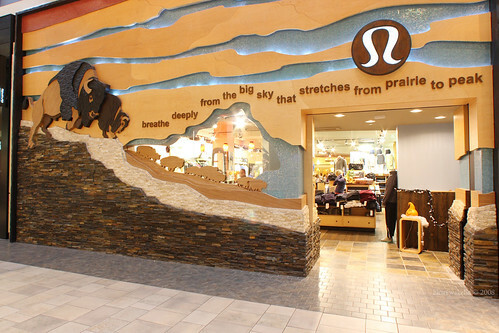 These are photos of lululemon athletica’s Chinook Centre storefront. 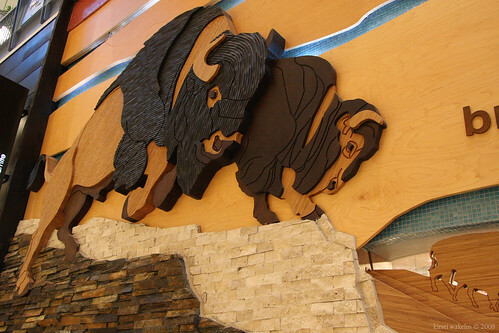 I illustrated the bison (my drawings were then cut out of layers of wood by the fabricator). This was the first time I saw them in 3D. They’re pretty big in person. More images, including the original drawings that were the basis for the final wooden artwork, are now up on my illustration portfolio. I haven’t visited your blog (or anyone else’s) in awhile. You sure have been doing a variety of different projects! Great stuff!